Just west of Olympia, capitol city of Washington State, there's a small saltwater inlet that's scenic at high tide, and fragrant at low tide. In this near mythical setting lies the Mud Bay Tiki Lounge, at which a strange crowd gathers, including government workers, hippie students, semi-employed loggers, the idle rich, and some unique bands. 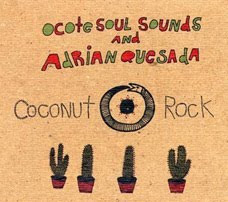 And if this album is any indication of their live sound, Ocote Soul Sounds should get a regular gig at the Tiki Lounge. Led by Martin Perna of Antibalas and Adrian Quesada of Grupo Fantasma, the group's sound is downtempo dubby Latin grooves with a side order of funk. While Ocote has a more relaxed approach to activism (with the exception of the biting anti-gentrification song "Vampires"), their chilled out sound will put you in the mind to make peace with your neighbors. And maybe you'll even dance with your social opposite to Ocote Soul Sounds at the Tiki Lounge next weekend. Stranger things have happened there.